As excited as I was to get Jack’s crib set up in his room, it was looking a little boring with the white crib, white mattress, and white sheet. It needed some pizzazz! And a method of hiding all that empty space underneath so I can turn it into some much-needed concealed storage (remember the dearth of closets in my almost-antique house?). Luckily, I’d seen this conundrum coming and picked up some navy cotton on sale at Hobby Lobby last week. I washed my two yards of fabric, gave it a quick pass with the iron, then laid it out on the office floor. In retrospect, I probably shouldn’t have chosen to work on the yellow rug. 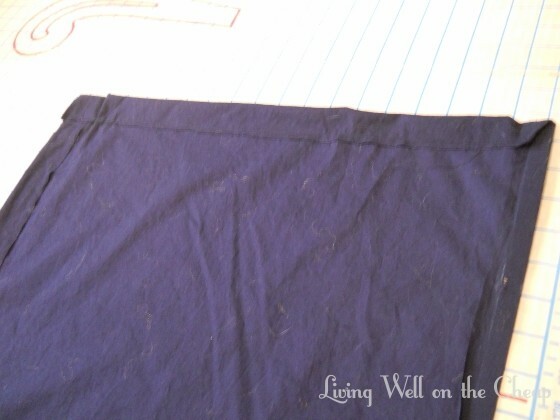 I got yellow fuzz all over my navy fabric and had to use the lint roller to get it off. Then, I cut my fabric in half lengthwise down the middle. I knew that these pieces were still wider than what I needed for the finished skirt, but I figured I’d just start with this and trim them more precisely later on. Jack’s crib measures 52″ across the front and 27″ wide. 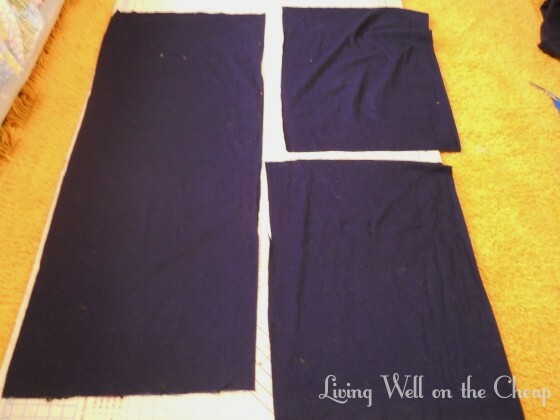 To allow for hems at the ends, I decided to cut one long 54″ strip and two 29″ strips. Then, I broke out this 10′ roll of half-inch magnetic strip and attached it along one long end of each fabric piece. My idea was that the magnetic strip would attach the fabric to the metal mattress support. I don’t have a picture of this step, but I folded the fabric over the magnetic strip and sewed it down, encasing the magnet in the fabric. I was so proud of my magnet idea. Unfortunately, my plans were foiled. The magnet turned out to be a little wimpy and wouldn’t stick to the metal with a layer of fabric in between, even though the fabric was pretty thin. I was totally bummed for about five seconds. Then I realized that the mattress support has a little lip along the edge, and the magnetic strip was perfect for wedging the edge of the fabric behind the lip and under the mattress. Sound confusing? I lifted the mattress up to take a picture that hopefully explains it a little better. 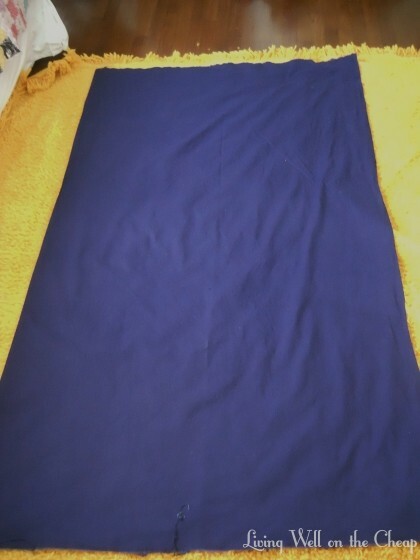 Since I’d left my fabric a little too wide earlier, I had plenty of leeway to make the skirt a little longer than originally planned to accommodate the extra fabric tucked under the mattress. I just kind of eyeballed how wide to make the hem then sewed along the bottom and two short edges. Then I repeated the whole process on the two side pieces. I tucked all three pieces into place and voila! Crib skirt accomplished! The best part is that I can easily adjust it when we eventually lower the mattress either by folding more fabric up at the top or trimming fabric off the bottom and giving it a new hem. 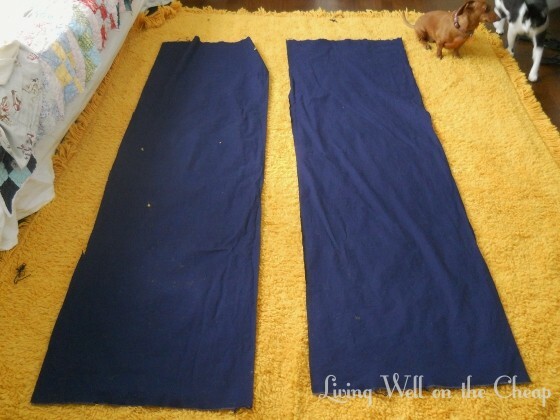 You could totally use this same method to make a skirt for any kind of bed. And since most mattresses are a little lower to the ground than in a crib you could probably get three widths of fabric from one piece, depending on how wide your fabric is, I guess. I love the simple and tailored look of this skirt. 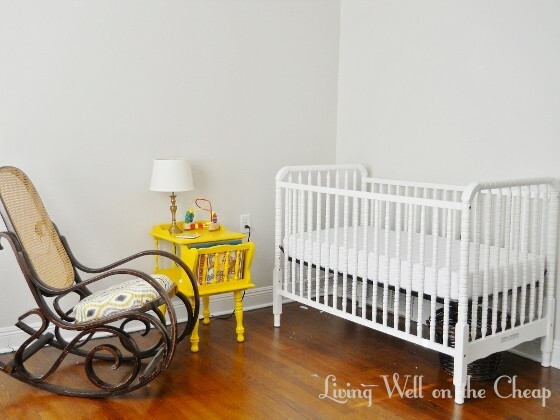 It’s about as masculine as something called a “skirt” can be, and I love that it will hide all kinds of ugly boxes and other necessities under the crib. Bonus: Pistachio hasn’t discovered it yet, but I’m pretty sure she’s going to decide the newly cave-like space behind the skirt is her new clubhouse. She’ll get bored with it after a few weeks and that’s when I’ll start stashing important stuff under there, like extra diapers and too-big clothes and whatever other accoutrements I’ve yet to realize accompany a new baby. Very inventive AND so cute!